Hasegawa Yuichi creates lush, textural prints using a unique woodblock technique: instead of carving one block for each color, the traditional manner, the artist creates his beautifully layered works with one block that he keeps carving, printing and effacing until he achieves his ideal image. This usually involves ten to 20 processes, perhaps one of the reasons his editions are especially small, sometimes eight or 10 and rarely more than 20. Working on traditional Japanese paper called torinoko, Hasegawa-san employs a traditional method of strengthening kimono stencils to his prints. This entails painting a layer of kakishibu (persimmon tannin) on the back of his torinoko to make it more pliable as well as resilient and strong. 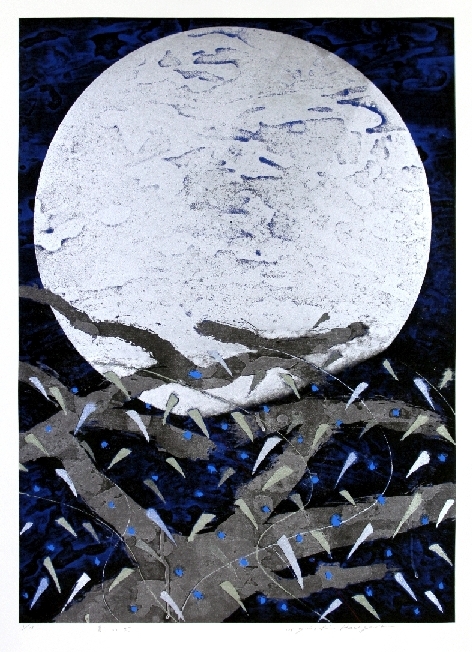 The artist was born in Aizu Wakamatsu, Fukushima Prefecture and began making prints in the 1970s. He has exhibited widely in Japan, as well as in Germany, Finland, Singapore and America.